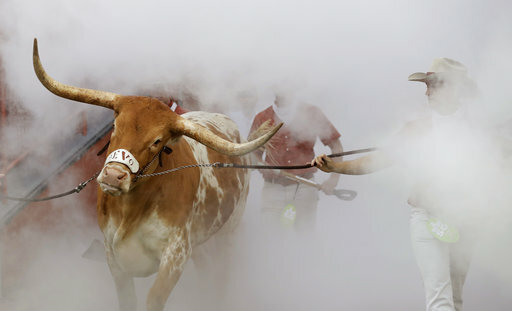 WAGS TRIBUNE: LIFE IN AUSTIN… LONGHORNS, BULLS, AND COLLEGE GAMEDAY…. CIRCLE THE WAGONS!!! Unlike previous chronicles, this one is a little less anecdotal and more commentary-style, which is a little different for me. Just a warning that I may lose focus along the way. Let me state the obvious. Our city has never been a good college sports town. I’ve only been back living in WNY for a couple of years now, but I’d like to see that change. Here we are today. There are whispers around our city’s prominent college football program of something historical brewing. Screams are on the horizon. Showcasing two of the nations most exciting weapons in ANY major conference, what is happening right now with the Bulls is unlike anything ever seen on campus, as BSP co-founder Paul Peck can attest to. Because this is a Bills-first city, Bulls quarterback Tyree Jackson and wide receiver Anthony Johnson may not yet be household names, even in their own city. That is changing each week. These guys are play-making offensive studs unlike anything that has surfaced in Amherst since the Bulls began playing games here. Believe the hype people. Embrace it. I bring all this up because I was able to become a college sports super-fan AFTER graduating from Fredonia in the 90’s and heading to ESPN in Bristol. Saturdays for me just weren’t the same as they were for most of the guys and girls I became friends and co-workers with when I started working there. Sure, growing up I remember the Doug Flutie Hail Mary game, the “band is on the field” play, the Lou Holtz Notre Dame years, and some Bo Jackson filthy highlights just doing it with Auburn. This happened by simply being an overall sports fan with eyes on a possible career in TV. Osmosis. Buffalo Saturdays were designated mostly for playing pickup games — remember those?!?!? — more than watching games on TV. While working in Bristol, as a kid from Buffalo, it should come as no surprise that my dream then was to cover the NFL and the NHL. I was never all that comfortable with my college sports knowledge. I even failed that part of my “quiz” before getting hired. I had no clue what teams played in what conferences. When I showed up for my first college football Saturday for a highlights session in the infamous ESPN “screening” room, it really hit me how enormous college football is in our country. I noticed that approximately 8 of 10 production assistants were as passionate about their particular school as I was about the Bills and Sabres. It didn’t take me long to quickly get caught up in the hoopla of College Football Saturdays. Sometime during my fifth year in Bristol, I was assigned to College Gameday – a huge privilege. The anticipation of working on a show like Gameday was unmatched. The “youthful exuberance” was so plainly obvious. To this day, there is nothing like it on television. Other sports have copycat shows. Gameday is on a whole other level. Why? One word. Excitement. Flash forward to when I accepted a job as a producer for Longhorn Network in Austin (something like 7 years or so ago). I couldn’t help but be blown away by how much fun it was to experience sports in a college town. Yes, Austin would be considered the larger side of college towns, but I guess what I’m trying to say is there are no professional teams in the city. The combination of pride, tradition, and exhilaration of a Saturday in the fall would get any fan pumped up to get into the action. I would love to see more college sports support here in WNY like I have witnessed from coast to coast all over the country. What I found out while living just a short walk from campus at the University of Texas, is the sports buzz in a college town is very similar to that of a major city. Look at it this way, Buffalo — here is what I took from living and working in Austin for three years. A city like Austin treats its history with as much sentimentality as we do, in some cases even more so as far as tradition goes. – Earl Campbell and Darrell Royal are as revered at Texas as much as Jim Kelly and Marv Levy are here. – People in Austin talk about Vince Young’s 2006 Rose Bowl upset over heavily favored USC in the same (exhausting) way that we do about The Comeback. – We have the “Shout” song. They have “The Eyes of Texas”. – Their local fans whine on local radio just as much as here. Everyone needs to be fired and benched every Monday, just like here. – The Longhorns’ mascot Bevo, the 1800-pound steer that sits in their end zone, made its first appearance in 1916, and rivals any goofy mascot we’ve had here in Buffalo. Okay.. besides maybe The Earl of Bud. I just searched “Buffalo Bills Mascot 2018″…. BILLY BUFFALO?!?! Stop. I was gone for awhile. Is Sabretooth still around? – No offense to the Goo Goo Dolls and the late Rick James, but Austin’s credentials as far as music goes is… well… a little more universally respected. They have Stevie Ray Vaughan, Janis Joplin and their Super Freak of country music Willie Nelson. Sooooo…. I did forget what point I was trying to make. Somehow this turned into a comparison between Buffalo and Austin, when I really wanted to make the comparison between a college sports town and a pro sports town – in hopes we could here in Buffalo reap the benefits of both! …anyhow, if you’re strictly a Bills fan, get out of your un-comfort zone. Embrace what is going on with these kids. It will – okay should – save you a lot of pain. It’s been a long time coming for college sports in Buffalo. Don’t stop cheering for the Bills. Just know it’ll be hard to argue what part of town where the more consistent W’s will be coming from. Mike’s had some unique experiences as a television producer. Read about his meeting with Gene Simmons and his experience covering Dancing With The Stars.